Enhancing power cycling capability of power semiconductor devices is highly demanded in order to increase the long term reliability of multilevel inverters. Ageing of power switches and their cooling systems leads to their accelerated damage due to excess power losses and junction temperatures. Therefore, thermal stresses relief (TSR) is the most effective solution for lifetime extension of power semiconductor devices. 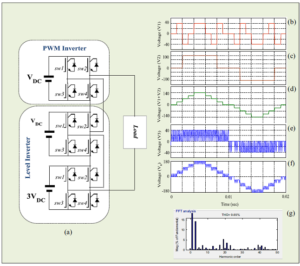 This paper presents a new thermal stresses relief carrier-based pulse width modulation (TSRPWM) strategy for extending the lifetime of semiconductor switches in single-phase multilevel inverters. The proposed strategy benefits the inherent redundancy among switching states in multilevel inverters to optimally relieve the thermally stressed device. The proposed algorithm maintains the inverter operation without increased stresses on healthy switches and without reduction of the output power ratings. In addition, the proposed algorithm preserves voltage balance of the DC-link capacitors. The proposed strategy is validated on single phase five level T-type inverter system with considering different locations of thermal stresses detection. Experimental prototype of the selected case study is built to verify the results. Moreover, comparisons with the most featured strategies in literature are given in detail. Fig. 2. Simulation results of the proposed strategy at TSD in SA11 at mi=0.85. Fig. 3. Simulation results of the proposed strategy at TSD in SA11 at mi=0.45. Fig. 4. Simulation results of the proposed TSRPWM strategy at TSD in SA12 and mi=0.85. 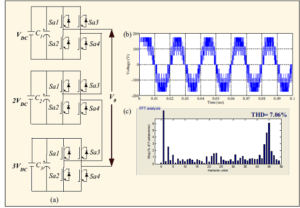 This manuscript presents an optimized, 3-ϕ, multilevel (MLI) inverter topology. cascading the level generation part with the phase sequence generation part derives the proposed system. Further, it can be operated at any required level depending upon the configuration of the level generation part. Thus, for higher level operation extra components are required at the level generation part only. Therefore, number of components required for the proposed MLI is lower than the conventional 3-ϕ MLI topologies for higher level operation. Further, the level generation part is shared in the three phases equally. This eliminates the possibility of phase unbalance. The working principle and the operation of the proposed MLI are supported with the simulation and experimental validations. Further, the proposed optimized MLI is also compared with the conventional 3-ϕ MLIs to prove its advantage. Fig. 1. (a) Circuit schematic for the proposed m-level MLI. (b) Configuration of top/bottom BU. Fig 2. Simulation results showing the (a) line to line voltages, (b) Output voltage of top BU, (c) output voltage of bottom BU, (d) phase to neutral voltages and (e) load current waveforms of the proposed 3-ϕ MLI in symmetrical operation. This paper presents an optimized 3-ϕ MLI configuration with reduced number of component. The prominent features of the proposed MLI are as follows. 1) Cascading LGP and PSGP builds the proposed MLI configuration. 2) For higher level operation only switches required are at the BUs only which resides in the LGP. This reduces the requirement of extra devices compared to conventional topologies. 3) Also, each dc voltage source in the presented MLI topology is equally shared by all the phases. Thus, any chance of inter-phase asymmetry is avoided. The above mentioned points support that the proposed MLI is an optimized configuration for 3-ϕ operation with reduced number of switches. However, the proposed configuration is operated by using the SVs up-to the red line only. The regular paper presents the further work with an improved PWM strategy which takes all the SVs in account . This will further increase the number of levels at the output and linearity can be maintained in over-modulation region with improved dc-bus utilization. J. Rodriguez, J. La i and F. Z. Pen g, “Multilevel invert er s: a survey of top o lo g i es, controls, and applications,” IEEE Trans. Ind. Elect., vol. 49, no. 4, pp. 724-738, Aug. 2002. K. K. Gupta, A. Ran j an, P. B hat nag a r, L. K. S a h u and S. Jain, “Multilevel Invert er Top o l o g i es With Reduced Device Count: A Review,” IEEE Trans. Power Elect., vol. 31, no. 1, pp. 135-151, Jan. 2016. Wu, Bin, and Meh d i N a r i man i. High-power converters and AC drives. John Wiley & Sons, 2016. 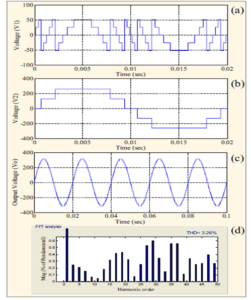 S. S. Fa z e l, S. Be r net, D. K rug and K. J a l i l i, “Design and Comparison of 4-k V Neutral-Point-Clamped, Flying-Capacitor, and Series-Connected H-Bridge Multilevel Converters,” IEEE Trans. Ind. A p pl., vol. 43, no. 4, pp. 1032-1040, July-a u g. 2007. L. Wang, D. Zhang, Y. Wang, B. Wu and H. S. At ha b, “Power and Voltage Balance Control of a Novel Three-Phase Solid-State Transformer Using Multilevel Cascaded H-Bridge Invert er s for Micro grid Applications,” in IEEE Trans. Power Elect., vol. 31, no. 4, pp. 3289-3301, April 2016. The main problem related to cascaded H-bridge cells multilevel inverters (CHBs) is their using of a large number of components, such as switches and DC-sources. Therefore, minimization of components in these kinds of devices is of great importance. Cascaded transformers multilevel inverters (CTMIs) have completely eliminated the need for several DC-sources in CHBs. Thus, minimization of the other components in CTMIs can lead to obtain an optimized structure for multilevel inverters. 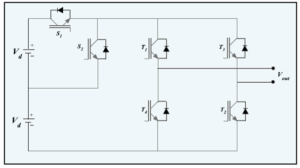 The present paper introduces a simple and compact structure for transformer based multilevel inverters. Since the number of utilized components in the proposed structure is remarkably reduced, the cost, volume and complexity are minimized. The performance of the suggested inverter has been scrutinized through two different strategies. Firstly, it is tested under condition of supplying a local load, and secondly, employing sample based current control strategy, its performance is inspected when being connected to the grid. In the latter test the leakage inductances of the transformers are utilized to execute the sample based current control strategy, thus, the need for extra filter is eradicated. The feasibility of the suggested topology has been validated by using laboratory-built prototype along with a computer-aid simulated model. Fig. 2. Simulation results of the output voltage, load current, FFT analyses, and switches voltages & currents. (a) Output voltage in no load condition, (b) output voltage and load current when supplying the RL load (c) output voltage and load current when supplying the pure resistive load. (d) FFT analysis of the output voltage in no load condition. (e) FFT analysis of the output voltage when supplying the RL load. (f) FFT analysis of the output voltage when supplying the pure resistive load. (g) Voltages and currents of the switches of the two outer legs. (h) Voltages and currents of the switches of the two middle legs. (j) Load and capacitor currents when providing active an reactive power (resistive-inductive loading condition). 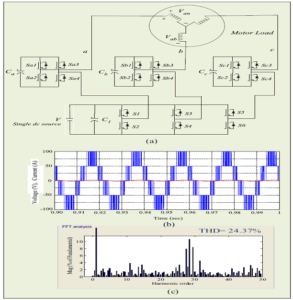 This paper put forth a novel nine-level topology for transformer based multilevel inverters. The proposed topology can deservedly reduce switches count of a nine-level single-phase multilevel inverter. To prove the feasibility of the suggested topology, by using a model simulated under Mathlab/Simulink environment and a laboratory-built prototype, it went under two different tests. Firstly, its performance was assessed when supplying a local load. The load was assumed to be either a pure resistive load or a resistive-inductive load. Secondly, employing sample based current control strategy, its performance was inspected under grid-tied condition. By employing a simulated model in the latter test, the proposed topology took the responsibility of delivering an assumed active power of 15kW, and 25kW to the grid. In the experimental test the power value injected to the grid was considered to be 800w. Since the CTMIs mostly use only one DC-source they are a competent candidate in microgrid and PV application. Being based on CTMIs, the proposed topology employs fewer numbers of components and offers the same advantages as the conventional topology does. When adopting the sample based current control strategy in grid-tie applications an inductive element is required to be located between the converter and the grid. 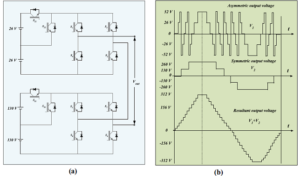 In this paper the leakage inductances of the transformers were used as the inductive filter. This facilitated executing the sample based current control strategy and consequently the need for an extra filter is eradicated. The other advantage of using transformers was their providing a galvanic isolation. To sum up, the accomplished tests verified the feasibility and viability of the suggested topology. Z. Peng, J.W McKeever, D.J. Adams,―A power line conditioner using cascade multilevel inverters for distribution systems,‖ IEEE Trans. Ind. Appl., Vol. 34, no. 6, pp. 1293 – 1298, nov. 1998. M. Tolbert, F. Z. Peng, T.G. Habetler, ―Multilevel converters for large electric drives‖. IEEE Trans. Ind. Appl, Vol. 35, no. 1, pp. 36-44, Aug. 1999. 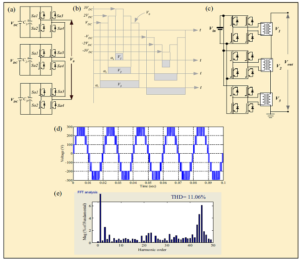 Dixon, J. Pereda, C. Castillo, S. Bosch, ―Asymmetrical multilevel inverter for traction drives using only one DC supply,‖ IEEE Trans Veh, Techno, Vol. 59, no. 8, pp. 3736-3743, Oct. 2010. Poompavai, A. Chitra, C. Srinivas, K. Giridharan, ―A meticulous analysis of induction motor drive fed from a nine-level Cascade H-Bridge inverter with level shifted multi carrier PWM,‖ in Proc. IEEE Int. Conf. on Smart Structures and Systems (ICSSS), 2013, pp 6-12. Suresh, A.K. Panda, ―Research on a cascaded multilevel inverter by employing three-phase transformers,‖ IET Power Electron, Vol. 5, no. 5, pp. 561 – 570, Jun. 2012. 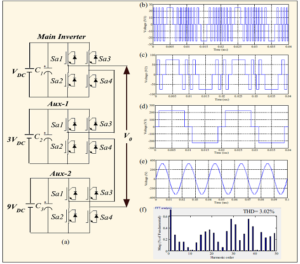 This paper proposes the combination of a novel modified quasi-Z-source (MqZS) inverter with a single-phase symmetrical hybrid three-level inverter in order to boost the inverter three-level output voltage. The proposed single-phase MqZS hybrid three-level inverter provides a higher boost ability and reduces the number of inductors in the source impedance, compared with both the single-phase three-level neural-point clamped (NPC) qZSI and the single-phase quasi-Z source cascaded multilevel inverter (CMI). Additionally, it can be extended to obtain the nine-level output voltage by cascading two three-level PWM switching cells with a separate MqZS and dc source, which herein is called a single-phase MqZS cascaded hybrid five-level inverter (MqZS-CHI). A modified modulation technique based on an alternative phase opposition disposition (APOD) scheme is suggested to effectively control the shoot-through state for boosting the dc-link voltage and balancing the two series capacitor voltages of the MqZS. The performances of both the proposed MqZS-CHI and the modulation techniques are verified through simulation and experimental results. Fig. 1. The single-phase modified quasi-Z-source cascaded hybrid five- level inverter. Fig. 2 Simulation results of the proposed MqZS-CHI when M = 0.8 and D = 0.2; (a) ac output and dc-link voltages, output and dc-link voltages of cell 1 and the ac output voltage, (b) carrier signals, shoot-through signal, reference signal, two inductor currents, dc-link and capacitor voltages of cell 1. Fig. 3. Simulation results of the proposed inverter when M = 0.7, D = 0.25: (a) switching frequency = 10 kHz, (b) switching frequency = 3 kHz. 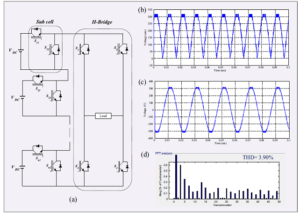 This paper proposed two novel topologies for a single-phase MqZS hybrid three-level inverter and a single-phase MqZS-CHI designed by cascading two three-level PWM switching cells in order to obtain the output voltage with nine voltage levels. Compared with both the three-level NPC qZSI and the three-level qZS-CMI, the proposed MqZS hybrid three-level inverter reduces the number of inductors by two. Its boost factor is higher by a factor of two relative to that of the NPC qZSI, although dc source current is discontinuous. The proposed topology can produce a nine-level output voltage, which only requires nine high-frequency switching devices and four low-frequency switching devices in the SPFB. However, the voltage stress across the four low-frequency switches is twice or four times higher than that of the high-frequency switches. On the other hand, the four switches in the SPFB can be implemented with the low-frequency high-voltage switching devices, and the switching loss can be reduced. Through the simulation and experimental results, the dc-link voltage of each cell is boosted by 2.8 times, and an output voltage of 155 Vrms can be obtained from a 50 V dc input voltage at the low shoot-through duty ratio as 0.2. The THD of the filtered ac output voltages with the four different voltage levels ranges from 2.49 % to 3.6 %. The proposed modulation technique offers a simple implementation, and the balance of the two series capacitor voltages of the three-level PWM switching cell can be achieved. Anderson and F. Z. Peng, “A class of quasi-Z-source inverters,” in Proc. IEEE-IAS Annu. Meeting, Oct. 2008, pp.1-7. P. Siwakoti, F. Z. Peng, F. Blaabjerg, P. C. Loh, and G. E. Town, “Impedance-source networks for electric power conversion part I: A topology review,” IEEE Trans. Power Electron., vol. 30, no. 2, pp. 699–716, Feb. 2015. P. Siwakoti, F. Z. Peng, F. Blaabjerg, P. C. Loh, G. E. Town, and S. Wang, “Impedance-source networks for electric power conversion part II: Review of control and modulation techniques,” IEEE Trans. Power Electron., vol. 30, no. 4, pp. 1887–1906, Apr. 2015. Ellabban and H. Abu-Rub, “Z-source inverter – Topology improvement review,” IEEE Ind. Electron. Magazine, pp. 6-24, Mar. 2016.